FRA: Hi welcome to FRA’s Round Table Insight .. Today, we have Jayant Bhandari. He is constantly travelling the world to look for investment opportunities. Particularly, in the natural resource sector. He advises institutional investors about his findings. He also worked for six years with US global investors in San Antonio, Texas, a boutique natural resource investment firm and, for one year, with KC Resource. He writes a lot of a number of publications including liberty magazine, the MC Institute, KC Research, Acting Man, International Man, Mining Journal, Zero Hedge, Little Rockwell, Frasier Institute and many others. He is contributing editor of the Liberty Magazine. Welcome Jayant. JAYANT: Thank you very much for having me, Richard. FRA: Great. I thought today we’d do a focus on the plight of the emerging markets, and you have graciously come up with a number of charts that can help form the basis of the discussion. We’ll make these charts available through the link on the website. 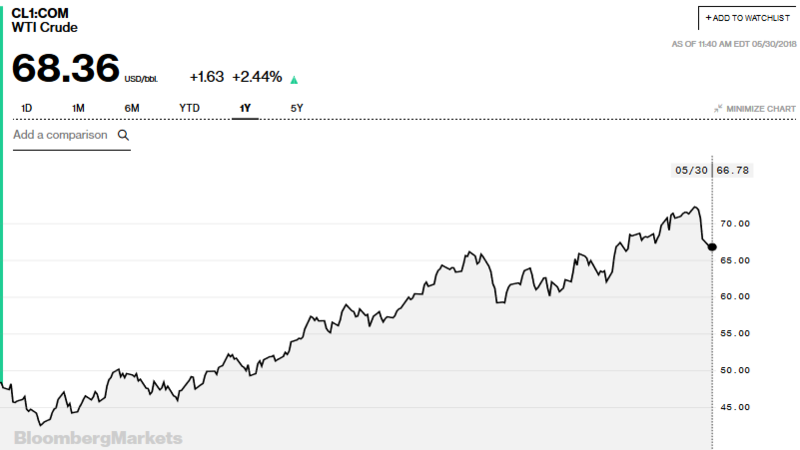 But, yeah, I wanted to focus on what’s happening in the emerging markets considering the trends in oil prices, in the US dollar, interest rates and what they have done in terms of investing in energy in particular, what they have not done is probably a better way to put it. Just wondering your initial thoughts on that to get the discussion going. JAYANT: What happened, Richard, was that from 1995 onwards for almost 20 years, emerging … What are now known as emerging markets did grow very nicely. They have grown by about 100% between 2002 and 2012 according to one of the charts that I sent you. While this growth was an extremely good growth for the emerging markets, from the base that they were starting at, the problem is that the growth rates of the emerging markets have been falling consistently for the last 10 years. 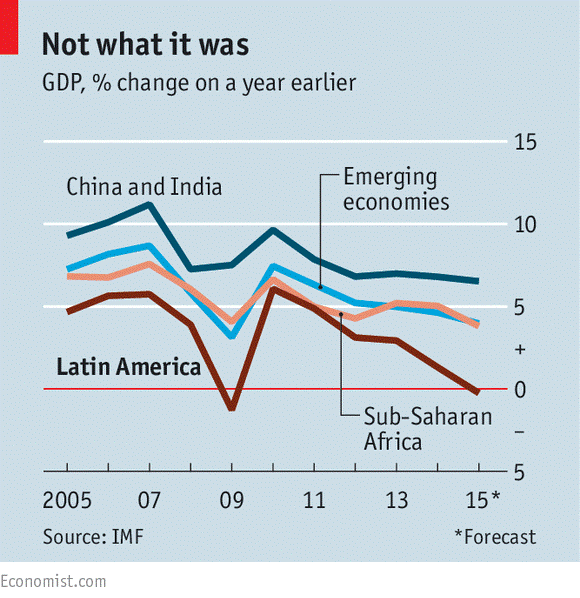 Now, if you pay closer attention to what’s happening in sub-Saharan Africa, the growth rate has fallen to only 1.4%. Now, when growth rate … Economic growth rate is only 1.4% and population growth rate is 2.8%, you actually now suddenly end up with a negative growth rate which is -1.4% per capital for sub-Saharan African. Growth rates in the third world are falling and in case of sub-Saharan Africa it is negative now—while there is still 1.4% GDP growth rate, population growth rate is 2.8%. The net effect is negative growth rate on per capita basis. Today, US 10-year treasury yields are inching towards around 3%. WTI crude has gone up from US$48 a barrel to US$68 today. JAYANT: What also happened in the last 10 years was that, a decade back, the western countries adopted very easy money policies which meant that money managers sitting in London and New York suddenly found it very attractive to invest in the third world countries, which were now known as emerging markets despite the fact that the risks of emerging markets were extremely high. They invested a huge amount of money in Africa; particularly money managers sitting in London did that. This money, while superficially was going to generate good returns for them, they did not really take into account the risks associated with investing in sub-Saharan Africa. These people gave a lot of money in US dollar denominated bonds of African countries. They got a much higher interest rate from these countries, but the problem is that Africa suddenly finds itself hugely indebtness. 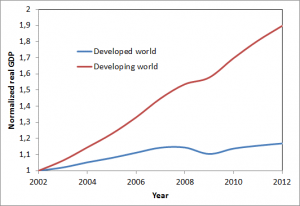 African was indebted by only about 30% in 2005 and now it is more than 50%. The reason it was only 30% 15 years back was that multilateral agencies forgave a lot of debt that African countries owned, and these people have then, again, taken a lot of debt in the last 10, 15 years, and they’re now hugely indebted. What you also find is that a lot of this debt money that African countries raise did not go into investing in capital. A lot of that money went to deal with budgetary deficits. Then, if you pay closer attention to the investments they made in capital, you also see that a lot of that money was not invested properly which means that now that yields on American dollar is starting to increase the currency values of these third world countries are starting to suffer rather badly, and as a result, their stock markets are falling, their currencies are falling and these countries will face problems paying their debts again. In 2005 the WB, IMF and ADB forgave debts of the heavily indebted poor countries, 30 of which were in Africa. These countries were growing very nicely during the same time. 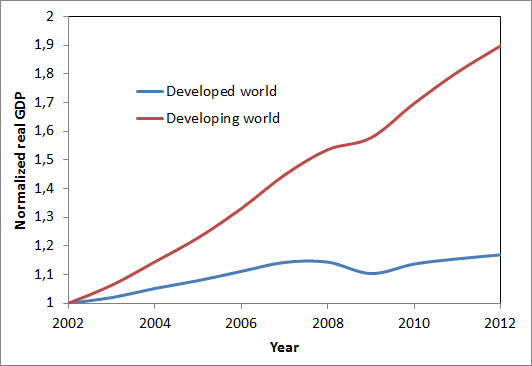 There was actually synchronous growth happening in the third world. 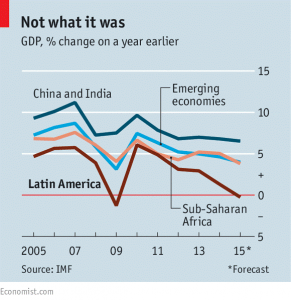 By early this decade, sub-Saharan Africa’s debt to GDP was 30%. This has now gone up to 50%. Given the past failures to pay, African countries pay higher interest rates. Then commodity prices started to suffer, there wasn’t enough revenue to service debts and the pace of borrowing picked up. Interest rates in the West were very low, which made it possible for increased flow of money from the West to Africa. Fund Managers in Europe invested hugely in Africa, particularly in their bonds those denominated in US$. Alas, this money went in to deal with budget deficits rather than in capital investment or in infrastructural investments. When money did go into capital investments, it was often squandered. FRA: You mentioned the money managers in London didn’t look at the risks at that time, what were those risks at that time in terms of the emerging market risks? JAYANT: The third world has a history of not honoring their debt payments, but every time there is a euphoria about third world countries, money managers in New York and London start thinking that the past is gone and the future is going to be different. Unfortunately, the future continues to be the repetition of the past which means that they keep giving money to countries like Argentina, Venezuela and countries in sub-Saharan Africa, and then the money refuses to return back to the western countries. These people including people in the World Bank, IMF and development banks around the world continue to lose money by giving too much easy money to these third world countries. FRA: So, you’re saying the loans made during the last 10 years did not go into capital investment or infrastructure investments. It just went to pay yearly budget deficits? JAYANT: Most of it, yes. If at all that money went into investing in infrastructure, it actually was mal-invested. There was a very interesting case of Mozambique in which a couple of billion dollars of money that was supposedly have gone through invest in government companies actually got mis-invested in good living of people in those companies. Yes, even the capital money that was invested in capital was mal-invested in many of these countries. FRA: Given how the US dollar trend has been strengthening recently, as you mentioned, these emerging market currencies have been weakening, and so it makes it more difficult to come up with the money, with the dollars to pay US dollar denominated debt, is that what you’re saying? JAYANT: Absolutely, and not only US dollar is improving, the problem is oil price has also been improving, so some of these countries that do not produce enough oil, actually not only have higher interest to pay on their debt, they also have to pay more money for their oil imports that they’re doing, which means that their currencies are suffering hugely. The above means that along with falling growth rates, the third world is facing increased interest rates on dollar-denominated borrowings and are also having to pay more for oil, which can be among the biggest imports of the third world. This is happening exactly when the governments and people of the third world were expecting continual improvements in their economies. JAYANT: I sent you some charts before our conversation started; Indian currency has fallen by more than 5% in the last few months. The result: Oil importing India’s currency has fallen by 5% y-to-y. As the recent result of increasing yields of US$, foreign institutional investors have been net sellers of Indian stocks and bonds. This will continue exiting going forward as the days of easy money are now gone. 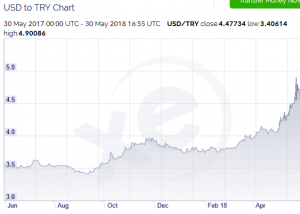 JAYANT: Turkish currency is in a free fall. It has fallen by 33% in the last one year. Turkish Lira has fallen by 33% y-o-y. 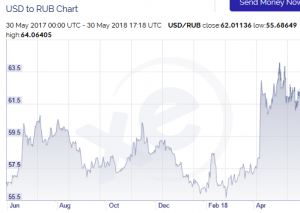 JAYANT: Even Russian Ruble which has fallen fair bit despite that fact that Russia is a net exporter of oil and gas and Brazilian currency, which again, is a country that exports oil and gas fallen about 13% in the last one year. In fact, Brazil is currently facing a huge amount of problems in the country. My Brazilian friend who I was talking with yesterday was telling that his stores do not have supplies anymore, she cannot find gas anymore, she is not driving anymore in the last two weeks because they don’t really have gas at the gas station. Brazil has lost 13% value of its currency despite that it is an oil exporting country. It is currently facing an emergency situation with truckers on strike. The stores have gone empty, vital supplies are not available, and gas stations have run out of fuel. As we speak Petrobras workers have gone on strike. Michel Temer, the centre-right President is failing to put things right. Angola and Venezuela are failing to benefit from increase in oil price, as their exports suffer. Angola has aging fields. As you can see in the currency graphs above, the fall in Argentinean peso, Indian Rupee, Turkish Lira and Brazilian Real has been most significant over the last few weeks exactly when US$ yields have creeped up. Even the oil-exporting oil countries (Chad, Venezuela, the Middle East, Angola, etc.) can no longer expect oil price to continue to increase, particularly in the long term. They must restructure their economies. JAYANT: The hospitals have run out of supplies because truckers are on strike which means that nothing really is moving much in the country, and there is a fear psychosis that has gone into the minds of these people despite that this friend of mine is living in gated community in a nice part of Brazil. Now remember, Brazil is an oil exporting country. Despite all that, these countries, in the third world, are continuing to face problems because they did not really invest properly when the oil prices were low. Remember, they were very dependent on oil revenue, so when oil prices fell down, they did not really have money to invest back into the fields. 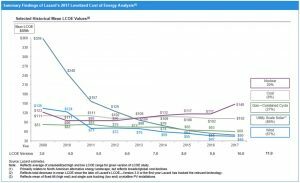 They actually used up the profit of oil companies for other purposes; for their budgetary purposes, and now that the oil prices have gone up, the problem is that oil prices have gone up but they can’t really produce enough to generate the good cash that they were generating when oil prices were higher in the last decade. For example, Angola was producing about 1.5 million barrels of oil every day and now it has fallen quite a bit from that level. I think it’s close to 1.5 million barrels per day or even less than that today. FRA: We essentially have a double win in terms of the oil price rising and the US dollar currency strengthening. I’ve read estimates there’s as much as 9 or 10 trillion in the corporate based US dollar denominated debt outside of the US. Is that your understanding and what will happen to this? What is the outcome or how do you see it play out? JAYANT: Well, I don’t have the exact number with me, but the problem with corporate debt is that, if the US dollar continues to be strong and the money continues to leave the stock market of these third world countries, how are these corporate going to actually pay the debt that they owe the western countries? It will become increasingly difficult, and with oil prices increasing, inflation in the third world countries, particularly those third world countries that do not produce oil that actually import oil, inflation will kick in and the profitabilities of these corporations in the third world will suffer. The end result will be that, in my view, a lot of this money is actually not going to return back to the first world. Also, at the same time, and at least I know data of India, foreign institutional investors were huge. 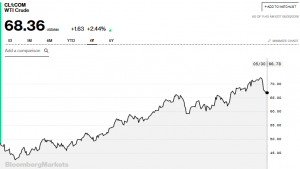 Net investor in the Indian stock market between 2017 and 2018, but in the last three months they have pulled out a significant amount of money out of India and the reason is exactly the same. The reason is that now is much nicer for them to invest in US dollar in North America so they’re pulling their money out of India. The consequence is not just that the stock market is losing money in India, but at the same time because India is losing US dollars, Indian currency is falling as well, and as you can see in the chart, it has fallen quite a bit in the last few months. FRA: How are they going to address their budget deficits? It seems like it’s going to get worse, especially now with interest rates rising? The dollar rising more difficult to make loans. JAYANT: Absolutely. I don’t know how they’re going to sort out these problems, but this is a traditional problem of the third world countries. They do not plan for tomorrow. They take as much debt as possible today and they use it up without actually worrying about tomorrow, and the western countries all consistently give the third world countries too much money without really understanding the risks involved in giving all that money. The end result is that the first world does not get its money back and the third world countries continue to suffer the problems they have historically suffered. FRA: Now, recently Argentina ran into that similar problems and they received some guarantees or a bail out by the IMF, I think, of about $30 billion, if I’m not mistaken. Do you see that as the outcome in other emerging markets? JAYANT: Well, look at Argentinean peso, it has fallen 40% in the last one year despite that fact that their new president is a pro-free market president, and he has been unable to control inflation in the country. He has been unable to control fall in the value of the local currency. 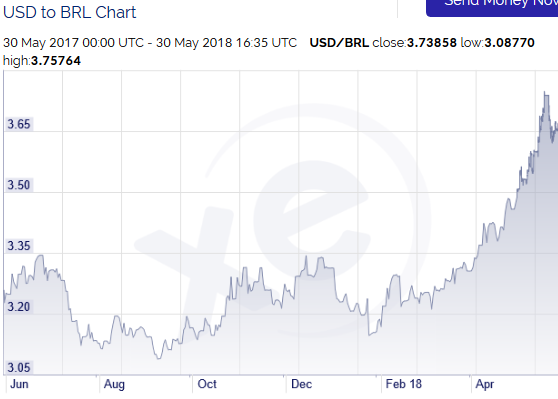 You see the same in Brazil, the president of Brazil is a relatively low pro-market president, and the society has gone against him because he has been trying to implement relatively pro-market policies, so yes, you can actually give them a buffer again. The problem is that these societies are relatively socialistic societies; they’re culturally socialistic societies, which means that they have a tendency to always go back to normal, which is, situations in which they cannot actually pay back their debts. Argentina continues to suffer despite the seemingly pro-freemarket President, Mauricio Macri. Its currency has fallen by 40% y-to-y. FRA: What about the situation on the energy? You mentioned the money borrowed over the last 10 years could have gone into infrastructure improvements, especially focused on energy but wasn’t. If you can elaborate on that, how is the situation worsening with some of these, particularly oil exporting nations? JAYANT: Well, look at Chad and Angola; they are two very interesting cases. Both of these countries have been facing fall in the export of their oil, and the reason is that when oil prices fell in the last decade from $150 to $50 per barrel, these countries because they had created government institutions large enough based on higher prices of oil, were unable to sustain the bureaucracy they had created with when the oil prices fell, the end result was that these people were no longer able to invest capital back into the fields that required capital that they must have invested in the oil fields, which means that they cannot actually increase their oil production now that the oil prices have gone up. But at the same time, oil prices are not going to go back to $150 anymore, and these people are structured to live on the basis of $100 per barrel of oil or higher, and the end result is also what you see in the Middle East, a lot of countries in the Middle East, look at Saudi Arabia, they are now in deficit situation consistently because the current price of oil despite being higher than what it was a year back, is unable to give them enough revenue to the government to deal with, to meet the requirements of the government, and they’re having to use up the money that they have saved over the last many years before the oil price fell. 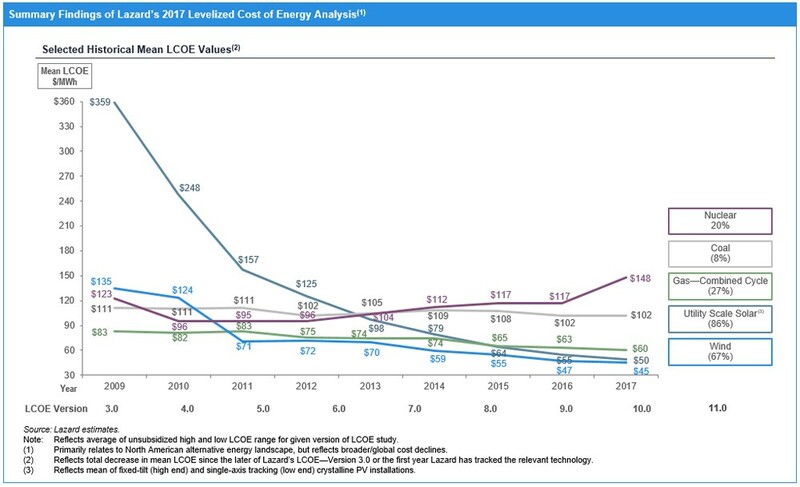 As you can see while costs of wind and solar energy were the highest ten years back, on relative basis they have become cheapest sources of energy. FRA: Could commodity prices in general go higher considering that oil is at the apex of the commodity stack, if you will? Could that happen even with the rising US dollar? JAYANT: Absolutely. Commodity prices can certainly rise higher, but commodity exporting countries have basically … Is still not have to feel confident about being able to benefit from higher commodity prices because when commodity prices go up, the cost of producing commodities tend to go up as well because some of the costs of making commodities are costs like oil and other commodities. But also, if you look at what’s been happening in most of Africa, while commodity prices might have gone up, they have actually increased their taxes and they have made it extremely difficult for mining companies to profit from investing in Africa. I’m talking about virtually every country in Africa. The end result is that African countries have become very difficult countries to invest for mining. You see problems in Ghana, you have always seen problems in Zimbabwe, you have increasing problems in South Africa. Unfortunately, even if commodity prices increase, these countries are very likely not going to benefit from that. FRA: Could we get a situation where with the rise in the interest rates in the US dollar, could we see a potential situation given the plight of the emerging markets whereby there’s an inflow or international capital flows from the emerging markets to the US equity markets in particular given rising interest rates not being good for the bond market. Could we see that similar to what happened in 1927 and 1929 where interest rates also went up and the US stock market also went up? This has been pointed out observers like Martin Armstrong, for example? JAYANT: I’m not sure what influence it will have on the US equity market, but I certainly see, before our conversation, I was looking at the increase in yields, and it seems to me that part of the reason why US yields have gone up is because the yields have also gone up in the US, which to me is a signal and a symbol that US economy is likely becoming more competitive, and I can see the reasons why it is becoming competitive; regulations are going down in the US, the tax structure and as a result I would not be surprised if equity prices in the US actually continue to improve. If American companies can bring in money from outside the US; if regulations go down and the corporate tax continue to reduce and the filing of tax requirements continue to become less stringent. FRA: Finally, what are your thoughts on where can investors protect themselves in this environment, or what makes sense in terms of generic asset class for investors? JAYANT: Richard, I continue to like East Asia: China, Hong Kong, Taiwan, Singapore, Korea, Japan. These are very good stable countries that continue to grow, and there are places where a stock market tend to be rather cheap. I like these countries to invest in. I like gold because the third world countries across the border are suffering and wealthy people in the third world will continue to invest their money in gold. The end result of which is that gold prices will perform going forward. Remember, gold prices have done very well in the last 10 or 15 year timeframe in the last 10 years in US dollar terms, gold has gone up by more than 100%. I continue to feel reasonably good about what’s happening in the US right now. FRA: Well, great. That’s awesome insight JAYANT, and thank you very much for the charts. How can our listeners learn more about your work? JAYANT: Everything I do goes on my website, which is Giantbhandari.com. FRA: Thank you very much Jayant. JAYANT: Thank you very much for the opportunity, Richard.